will let you know @Gandhi A once the valuation is completed. After Sankranthi Holidays. might be during 3rd or 4th week of January 2019 mostly. will alert you exact week once the valuation is completed. shaik jameel and Gandhi A like this. When are results expected sir?How many spells remaining? Still valuation is in progress. will let you know once its completed.[/QUO. Can you please update the status about the 4-1 results? 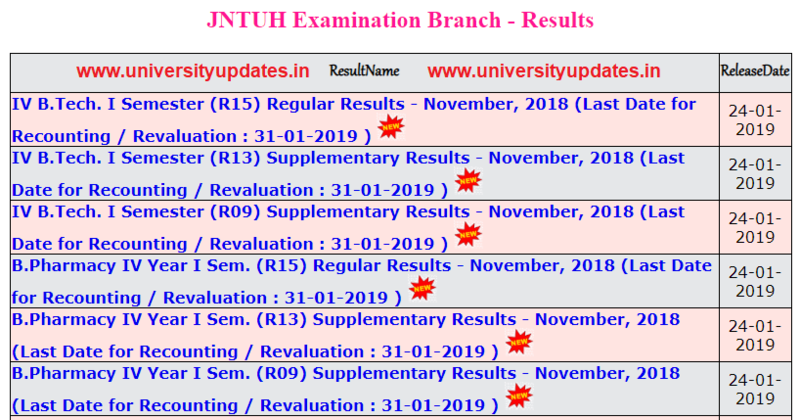 Can you please update the status about jntuh 4-1 results? The website that every one trust and use your app for geninue information but their is no reply from your side regarding info on 4-1 results? Rahul, Gandhi A and shaik jameel like this. @Rahul bro atleast inform the expected week for results. Is valuation completed or not? Kindly give some information!! We are waiting here for your response! Rahul and Gandhi A like this. Will update the details tonight or by 2morow mrng. shaik jameel and ravi123 like this.